A U.S. offer in late 1946, after stopping dismantling for Soviet reparations from its zone, to join up the western zones as one economic unit led in January 1947 to the economic merging of the British and U.S. zones into the Bizone. At the beginning of June 1947, an attempt was made to bring all of the German minister presidents together for a conference in Munich. The attempt ended abruptly, however, when the Soviet zone representatives left before the conference even started. For the heads of the German states in the western zones, this made the de facto division of Germany perfectly clear. From November 25 - December 15, 1947, the foreign ministers of the four victorious powers met in London to address the German question, but this conference failed to produce results. 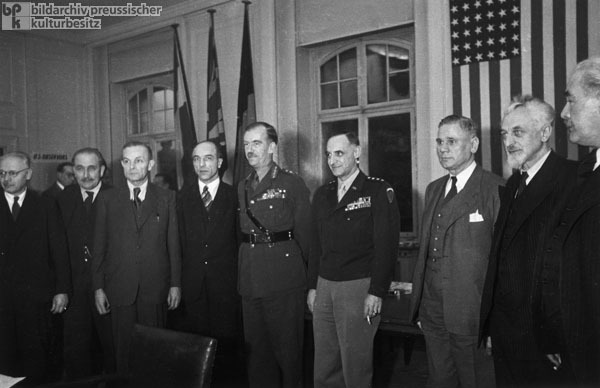 Thereafter, at a meeting held in Frankfurt am Main on January 7, 1948, the British and American military governors, Brian Robertson and Lucius D. Clay (respectively), presented the minister presidents of the "Bizone" with their idea for expanding the "Bizone" administration: the Economic Council (the "Bizone parliament") would grow from 52 to 104 members; a second chamber, a State Council with two representatives per state, would also be established; under the chairmanship of a supreme director elected by the Economic Council and confirmed by the State Council, the directors of the five administrations would also form an Administrative Council (virtually a "government"); additionally, it was announced that a German supreme court and a central bank would be established. The weekly newspaper Die Zeit commented that the developed "Bizone" would be less than a state but more than a mere economic administration. In the photo, we see the two military governors and the minister presidents: Christian Stock (Hesse), Wilhelm Kaisen (Bremen), Hans Ehard (Bavaria), Karl Arnold (North Rhine-Westphalia), Brian Robertson (British military governor), Lucius D. Clay (United States military governor), Max Brauer (Hamburg), Hermann Lüdemann (Schleswig-Holstein), Hinrich Kopf (Lower Saxony). Photo by Hanns Hubmann.